October is Breast Cancer Awareness Month. It is a yearly campaign that happens all around the world to help increase awareness about this sickness. More people are being diagnosed with breast cancer every year. But because of the campaign, there are also more people surviving it. And being able to detect the cancer at a very early stage is very helpful. We are also reminded that even though knowledge is power, it is equally important to have a plan in action or what measures to take to overcome this illness. 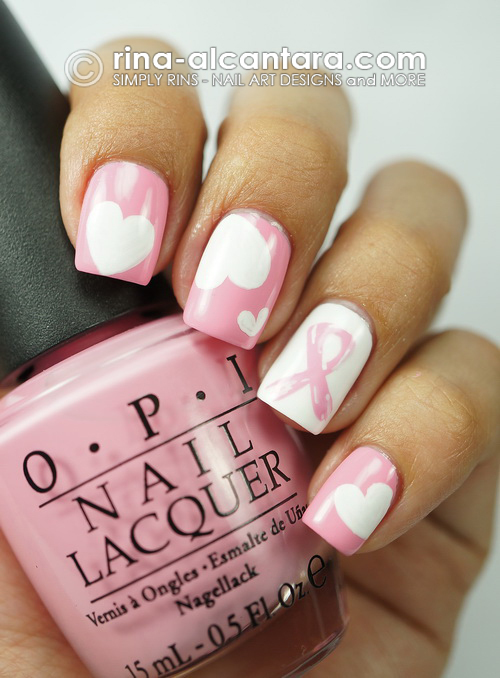 I'd like to contribute to this campaign by posting 2 nail art ideas I came up with for Breast Cancer Awareness Month. For base color, I applied 2 coatings of Dazzle Dry White Lightning on my ring finger and used 2 coats of Dazzle Dry Heart on Fire, a slightly dark, creme pink polish for the rest of the nails . 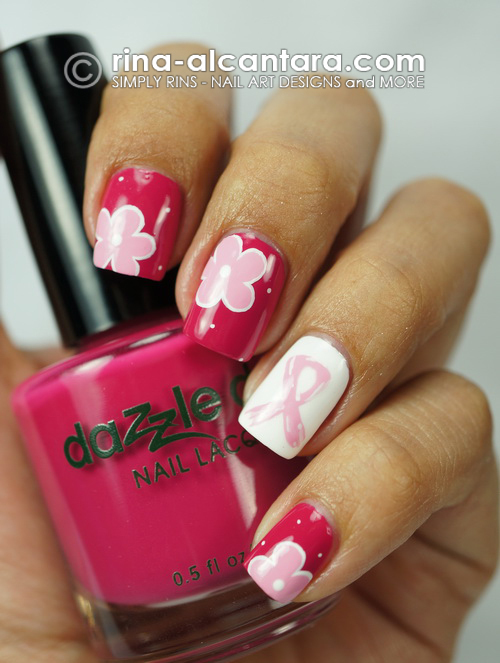 As I was doing this design, it reminded me how Dazzle Dry was very apt for this nail art. It is a completely vegan nail lacquer, without any toxic substance. It's perfect for the campaign because the brand helps us to be conscious on how we should take care of ourselves. It is not just a nail polish. 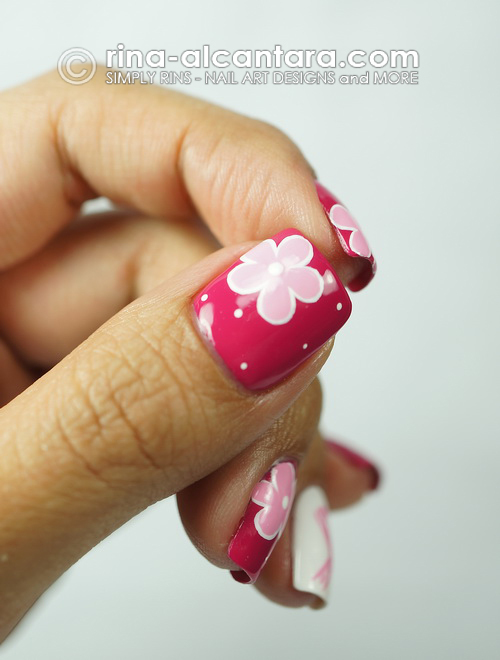 I painted a light pink ribbon on my ring finger and big pink flowers on the other nails to complete the look using a detailing nail art brush and acrylic paints. I really don't have a lot of pinks on my polish stash. But I really wanted to use a baby pink shade and I was lucky that at least I had one. This is 2 coats of OPI Pink Friday, a basic creme pink color from the OPI Nicki Minaj Collection. I retained the pink ribbon from the previous design on my ring finger. And for subtlety, I painted big and small white hearts on the other nails. All designs were hand painted with acrylic and a detailing nail art brush. The idea for both instances was to come up with dainty and tasteful nail art designs and hopefully I was able to achieve that. And I hope with this post, I could encourage a lot of people, especially the ladies, to seek more information regarding breast cancer. Breast Cancer Awareness groups and organizations cannot emphasize enough the importance of early detection. Disclosure: I submitted both of these Breast Cancer Awareness nail art designs to Nail Tropics for a project collaboration this month but didn't make the cut. So I opted to post them here instead for my annual Breast Cancer Awareness nail design feature. These are both beautiful!! I especially love the light pink manicure. Awesome job!! Both really gorgeous, perfect painting. My mom had breast cancer but luckily they did a double mastectomy and removed everything to be safe and shes ok. :) it always makes me happy to see people supporting and helping. I absolutely love both of your designs. As a medical practitioner (and breast cancer advocate), may I remind all the lovely ladies and all the men who have ladies to love: monthly breast self-examination for everyone with breasts, and yearly mammogram for ladies above 40 years old..